Goliad, TX – Presidio La Bahia Loreto Chapel. Photo by Kathy Weiser-Alexander, December 2016. Click for prints & products. The Presidio Nuestra Señora de Loreto de la Bahía (Presidio de la Bahía) served the people of four independent nations: Spain, Mexico, the Republic of Texas, and the United States, and is recognized for its cross-cultural, religious, and military significance. 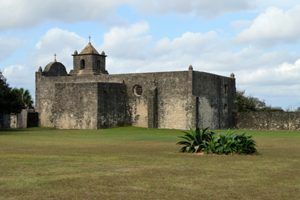 Constructed in 1749 to protect the Spanish missions in South Texas, including the nearby Franciscan Mission Nuestra Señora del Espíritu Santo de Zuñiga, the Presidio de la Bahía is an outstanding example of a Spanish military compound. The presidio played a critical role in the development of Spanish and Mexican culture in the region and was important in conflicts that took place through the years of the Mexican Revolution (1821) and the later Texan Rebellion(1836). Today, the entire military compound, including the chapel (the “Lady of Loreto”) has been carefully documented and returned to its 1836 appearance. 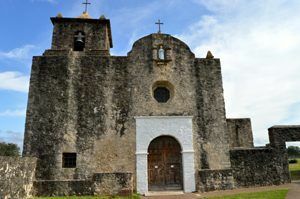 The National Historic Landmark now stands as an important religious and cultural center in the community of Goliad, Texas serving as both a church and heritage site. Visitors to the Presidio Nuestra Señora de Loreto de la Bahía can explore the site to learn more about its history and stories that span over 250 years. 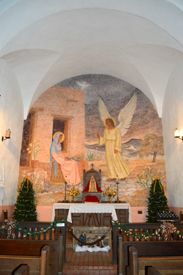 Our Lady of Loreto Chapel at the Presidio de la Bahi­a. Photo by Kathy Weiser-Alexander December 2016. Click for prints & products. The Presidio was the site of several conflicts over the course of the War for Mexican Independence (1810-1821). In 1812, a Mexican force led by Bernardo Gutierrez and August Magee took the fort from the Spanish and held it during the resulting siege. 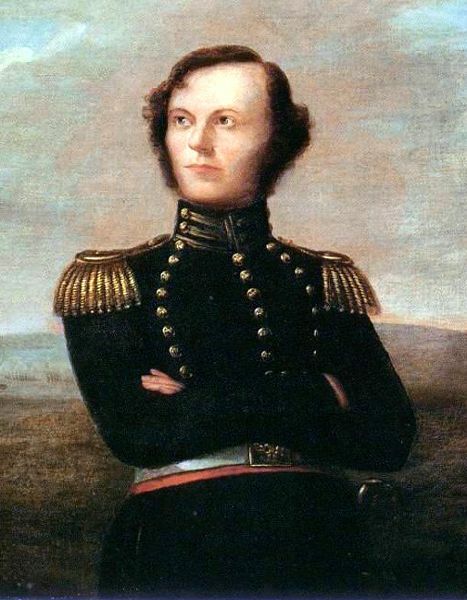 In 1817, when the Presidio was once again under Spanish control, Lieutenant Henry Perry led 50 men against the fort, but failed to take the Presidio before Spanish re-enforcements arrived. Finally, in 1821, James Long and his force of 54 civilians captured the fort, and held it for 24 hours before surrendering. The Presidio – known as Fort Goliad – also played a significant role during the ensuing Texas Revolution. The Texan forces successfully took Fort Goliad from the Mexicans in 1835, but breakdowns in communication and command left them disjointed and weakened throughout the region. During the winter of 1835-36, one of the most horrific episodes of the war took place at the old presidio. Colonel James W. Fannin was in control of Fort Goliad at the time and, fearing approaching Mexican forces, decided to retreat with his supplies and men. Just two weeks after the famous Texan defeat at the Alamo, Fannin’s troops encountered the Mexican army. The Mexicans captured the Texans after a brief battle and took back the Fort Goliad chapel. After the Mexicans held the Texans prisoners for a week, word came from Mexican General Santa Anna to execute all of them. Between 300-400 Texans lost their lives on March 27, 1836. Soon after, the former Presidio de la Bahía was abandoned. Our Lady of Loreto Chapel, Presidio La Bahia, Goliad, Texas, Kathy Weiser-Alexander, 2016. The Presidio Nuestra Señora de Loreto de la Bahía is a National Historic Landmark located one mile south of Goliad State Historical Park on U.S. 183 one mile south of Goliad, Texas on U.S. Highway 183 (77A). Compiled and edited by Kathy Weiser, December, 2016.